The number and type of tools carried depends on the nature of your journey. At a bare minimum, for a tour that doesn’t stray far from bike shops, one should carry a bike pump, puncture repair kit, chain breaker (along with chain pins), and the basic tools that come in the standard folding tool packs that are sold in bike stores. With these basic tools a flat tire, broken chain or loose nuts and bolts can be repaired. Another common problem that can quickly halt progress is catastrophic spoke failure. To prepare for this emergency, you need spare spokes (make sure they’re the right length) spare eyelets and a spoke wrench. Unfortunately, if the spokes break on the right side of the rear hub, it will be necessary to remove the cassette, which involves additional heavier tools. It would only be recommended to carry these extra tools for remote or expedition touring. It is sometimes possible to thread the spokes (with great difficulty) through the cassette without removing it. The more remote your journey, the more tools and replacement components you may wish to carry. Bits and pieces that sometimes break while touring (apart from basic component wear mentioned below) include brake cables, cable housings, rear derailleur and rims. For basic touring it is advisable to carry a spare tire, spare inner tubes, brake pads and spokes. Bailing wire and duct tape can also be handy. An odometer is essential. They are generally cheap, and all work well. Wireless odometers tend to be a little less reliable. Padded handlebar tape can make things more comfortable, along with padded gloves. Good for securing tents, sleeping mats, etc on top of the racks. If you strap gear on the top of your rear rack, it will block most of the wheel spray. Front fenders will increase comfort. Standard flashing red L.E.D. 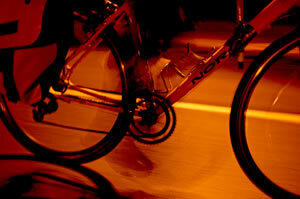 lights should be displayed on the back of your bike at night along with reflectors. A good Petzl-style headlamp will allow you to see where you are going, and will alert traffic of your presence. A bell can be handy for politely urging pedestrians off your path. The German manufactured Airzound is the world’s loudest bike horn. A lightweight plastic reservoir contains compressed air which can be refilled with a bicycle pump or at a service station. The blast from this horn is enough to alert a semi driver of your presence when you’re about to be cut off. Shimano offers three lines of components for mountain and hybrid bikes – LX, XT, and XTR. LX is the lower end, XT is more durable, and XTR is made for racing, and thus is lighter. It is often said that strength is sacrificed for weight with XTR, so XT is probably the best choice for the touring cyclist. LX is a satisfactory less-costly alternative. Your drive chain is generally the first major system to wear out. This is composed of your chain, front cranks, and rear cassette. Shimano recommends replacing your drive chain at about 2500 km however, it will generally last 5000 km or more with regular lubrication and cleaning. Indicators of heavy wear include visible erosion of the teeth in the chain rings, chatter, chain sticking when changing gears, and, in extreme cases, the chain slipping on the rings when under load. Usually the chain is the first part of the drive chain to wear out. If the chain disintegrates at 3000km or more, it is usually necessary to replace the entire drive chain even if the rest of the system is in reasonable shape. This is because the chain and the chain rings wear together, making old and new components incompatible. Since the chain is generally the weakest link in the system, some touring cyclists will replace the chain at 2000 km, before wear compatibility becomes an issue. The bottom bracket is the rotating structure that your pedals and front chain rings are affixed to. It will normally last 7,000-15,000 km. Replacement is recommended when there is play in the system. These will generally last 12,000-20,000 km, and need to be replaced when play is excessive. Often it is best to replace the entire wheel.